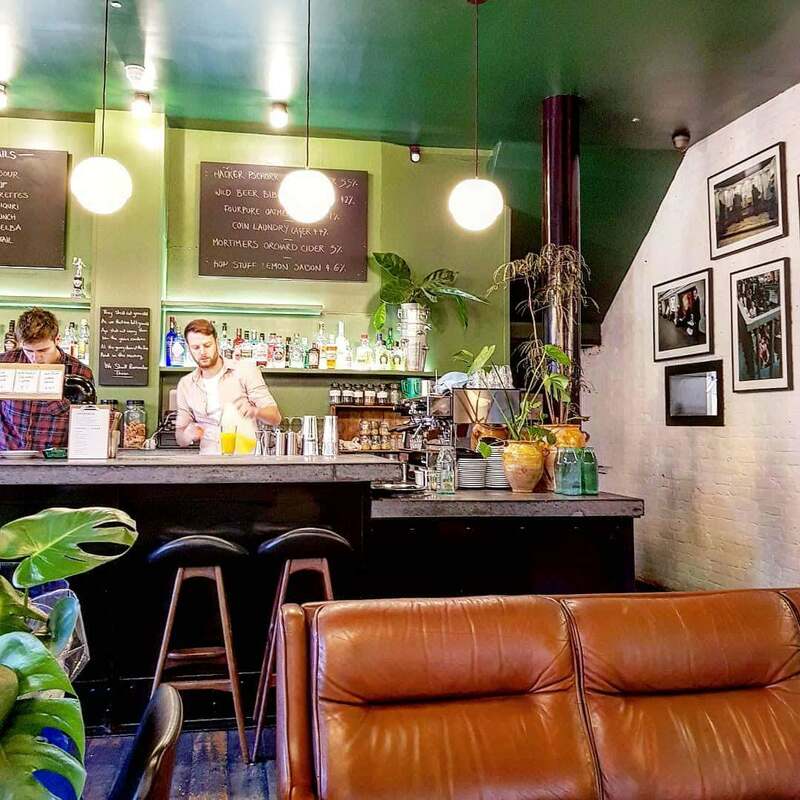 Coin Laundry is a cool, relaxed spot on the corner of Exmouth market. It has an empty warehouse feel, with its high ceilings and open plan – almost like it’s been moved from the heart of Shoreditch or Hackney. It’s light and bright, and the interior is filled with blues, greens and woods, with flowers on the tables. It gives off a spring/summer season vibe, as though they’re bringing a bit of the outside in, yet it’s still cosy. Service was friendly and accommodating from the off, and it didn’t take us long to get our Sunday roast orders in. 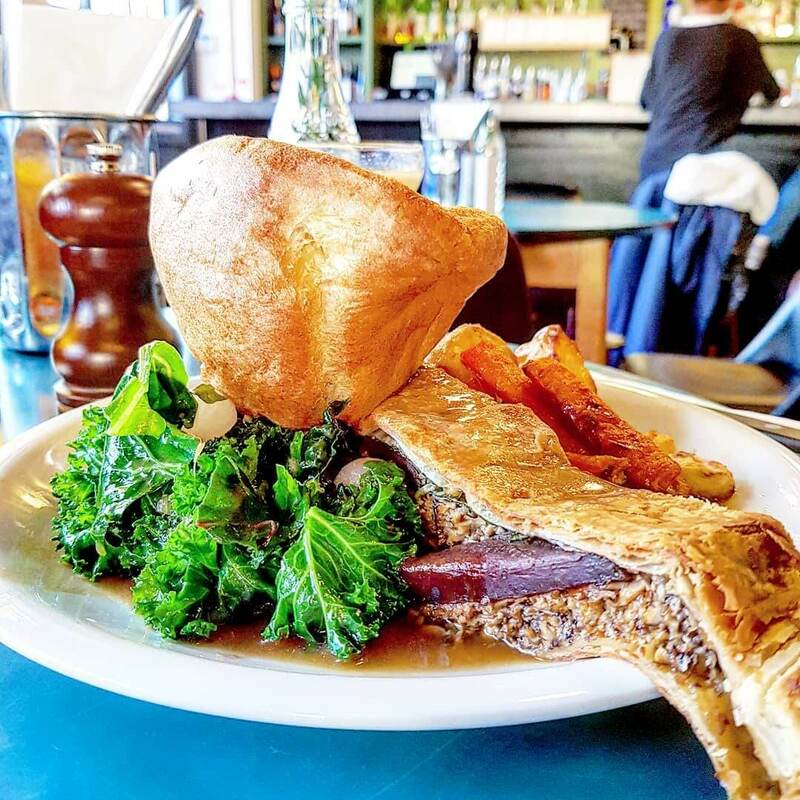 The Sunday menu runs from 11am through to 9pm – pretty good for a menu featuring roasts. 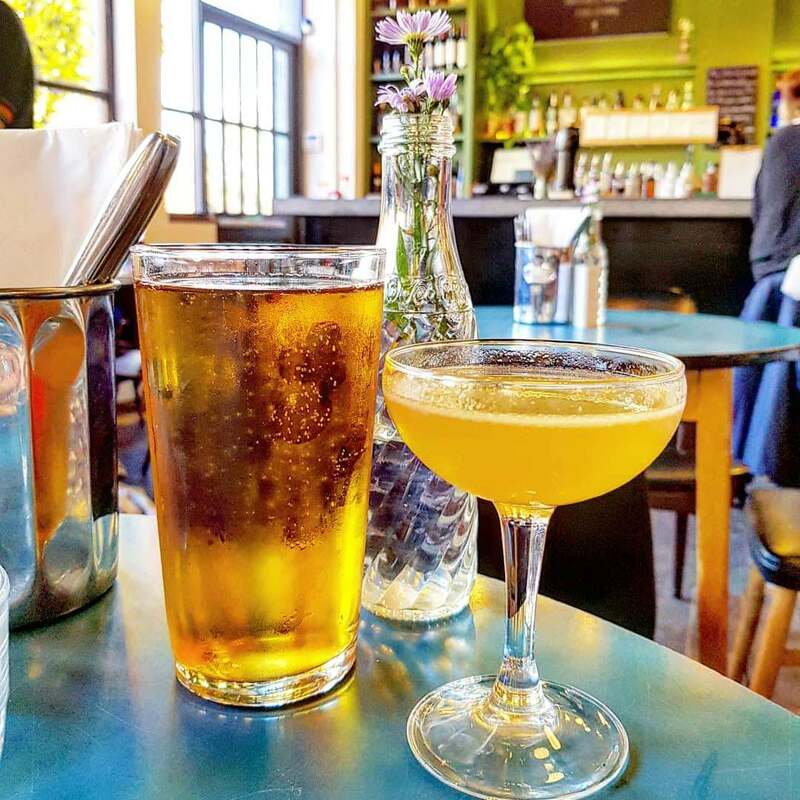 There are a number of snacks, sharers and small plates for if you’re just popping in for a light lunch or nibbles over a catch-up, as well a few regular mains too (including a beef burger and cauliflower and okra curry). 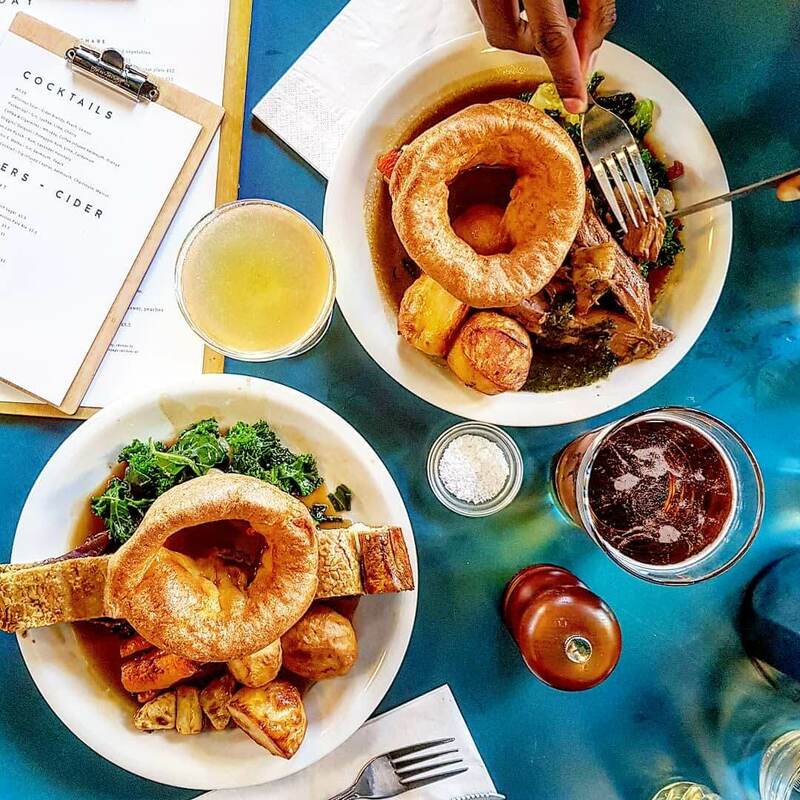 But on a sunday afternoon, there’s just one thing for it…a roast. 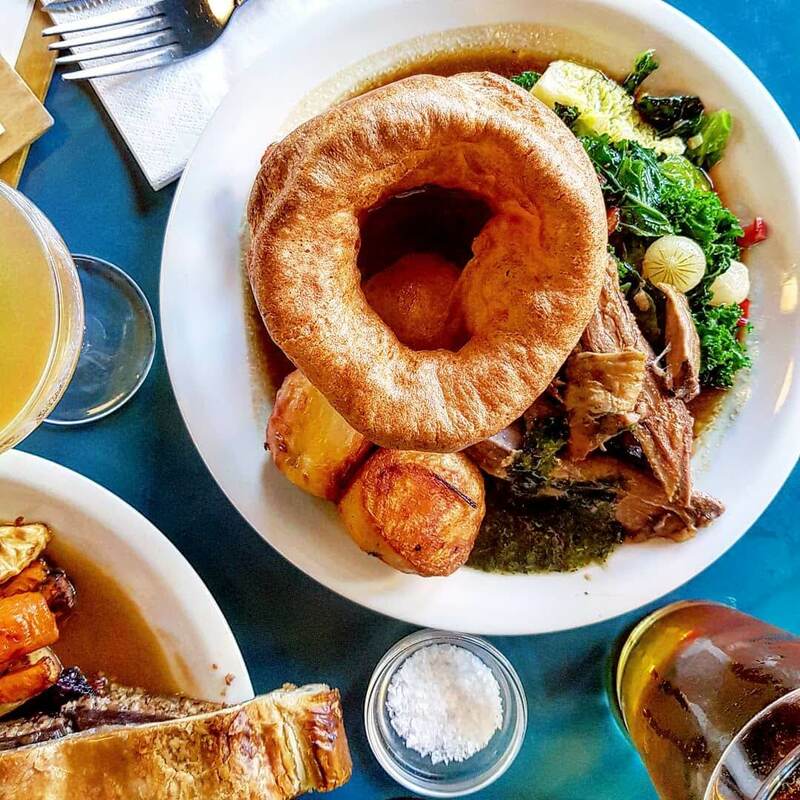 The roast menu features four options, three meat and one veggie. All served with roasties, seasonal veg, a Yorkshire pudding and gravy. Vegetarian options often get slated when it comes to roasts. But this one, the Beetroot and woodland mushroom Wellington with porcini gravy, was actually pretty good! No soggy bottoms here – the wellington was delicious. Whilst whole/larger pieces of mushroom would have been preferred to finely chopped, alongside the beautifully roasted beetroot, it still had a great flavour. The mushroom gravy was delicious too – and there was plenty. The Slow roast lamb leg with mint sauce did however steal the show. The lamb was tender, with a fantastic flavour. There was plenty of bold mint sauce to accompany the dish too. The roasties were fluffy inside and nice and crisp outside, and the selection of seasonal veg was great too. We loved the mix of greens and pearl onions which is being served right now! As for the Yorkshire puddings, well they were massive! Overall a super generous portion – I was stuffed! 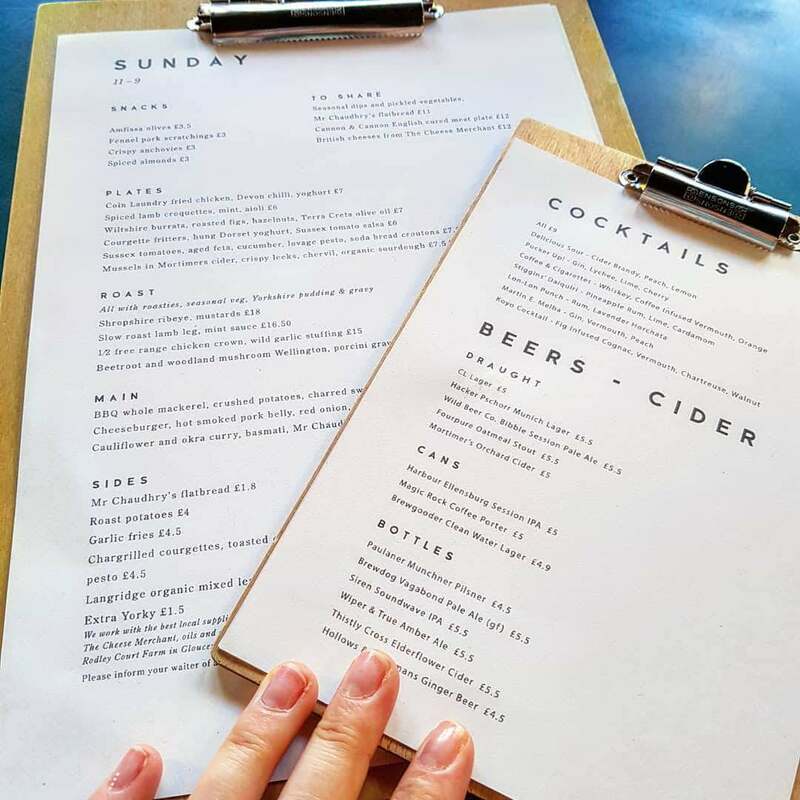 The drinks menu features a handful of cocktails, draught, canned and bottled beer, plenty of wine and spirit options too. The Mortimer’s Orchard Cider (draught), was delicious and helped continue the early autumn vibes as it was pretty warm out. The Stiggins’ Daiquiri, a mix of pineapple rum, lime and cardamom, was strong and a little tart, but went down oh so well. We literally had not even a slither of space for dessert. But if you do have a sweet tooth to satisfy, there is a dessert menu with three options – dark chocolate fondant, panna cotta and cheesecake. 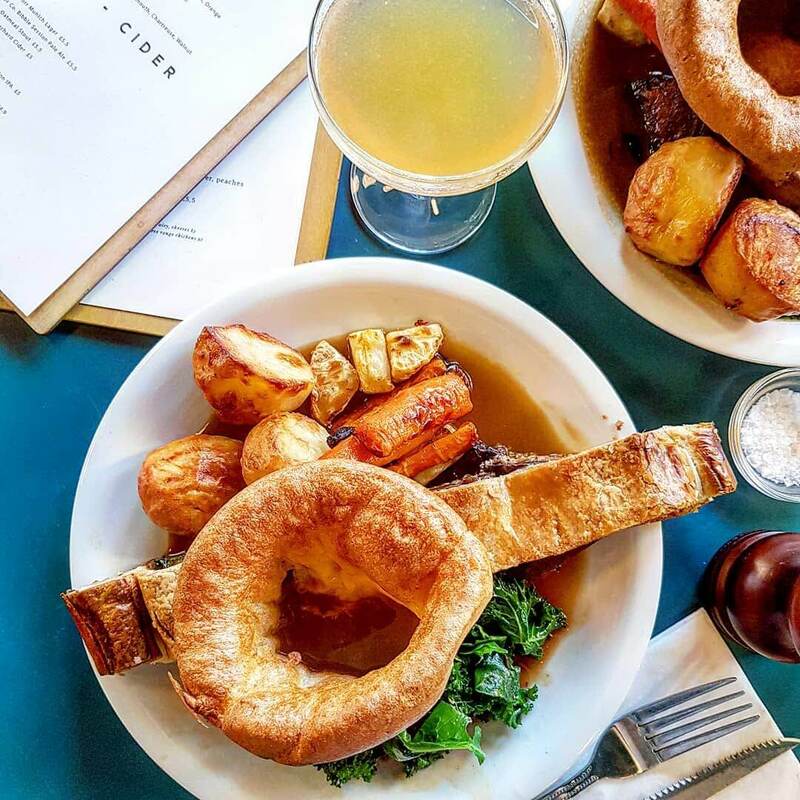 Price: Roasts are priced between £13.50 and £18 which is pretty reasonable for London. Drinks are pretty reasonable too – the pint was only £5 and the cocktail was £9. 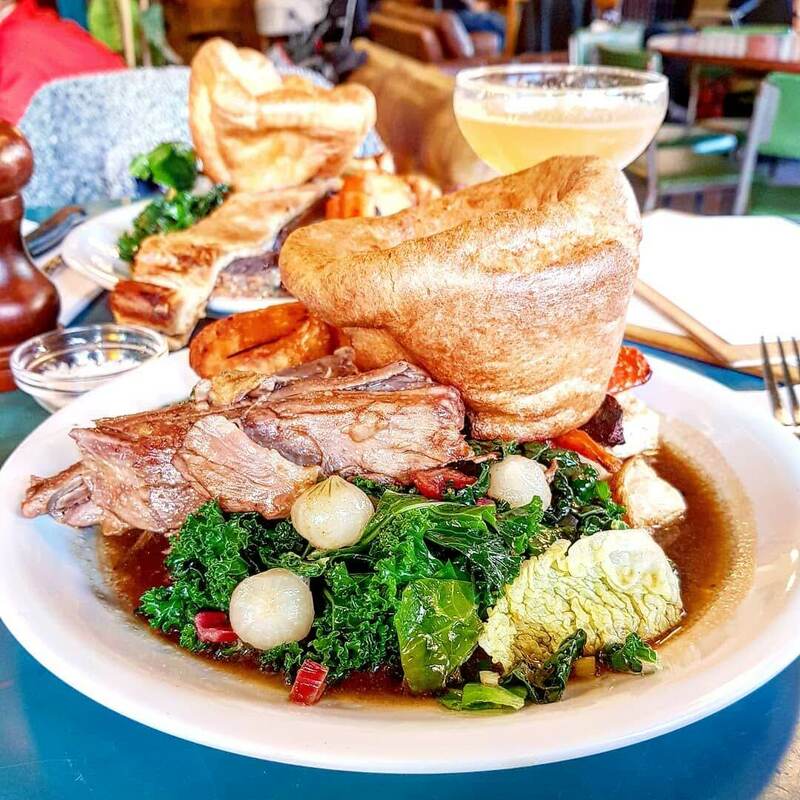 Food: Fab roasts – the veggie option impressed, but the lamb did steal the show. Very generous portions. Drinks: Plenty of options. The Stiggins’ Daiquiri was a fab cocktail! Atmosphere: bright and contemporary, yet cosy, spot for Sunday lunch. Friendly service. Wait: Not overly busy the Sunday we visited. Do book ahead if you can though. There is a basement area too, with bar, which opens into the evening – open until 1am Thursday to Saturday. I’ve been along before for drinks and nibbles, and it’s a fab spot for this – read my post on this here. 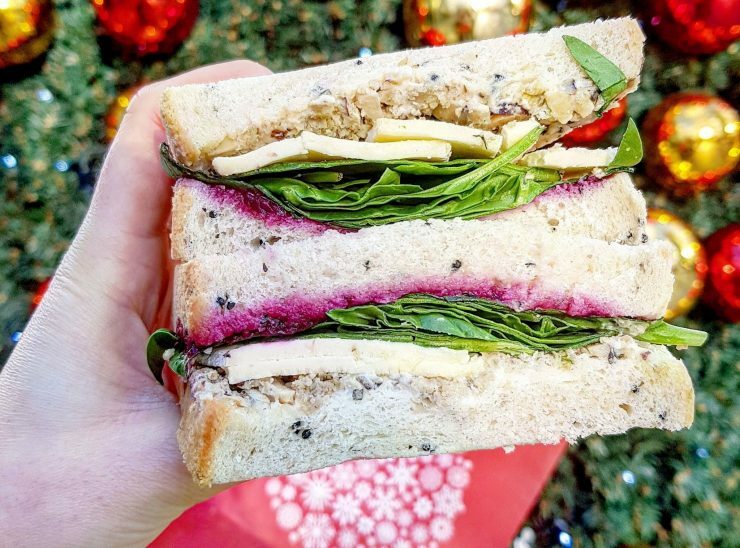 Chloe Tries|| Foodie Monthly – CHRISTMAS!